I was quite puzzled by the general lack of information and clarity over treatment of scorpion stings. A phone call from a friend requesting urgent help from a remote forested area triggered me to put together this blog on scorpion sting response. Medical school text books are quite confusing. The ones that we hold holy are mostly US or European in origin. Although many of them are quite globalised, the specific information on “local” conditions say tick-borne fevers or insect/animal bites/stings or injuries is quite lacking. In the case of scorpion stings, what I recollect from medical school is that Indian scorpions stings are never fatal. I vaguely recollect some discussion that the venomous scorpions are from Latin America or Australia. This was not an expected question for the exams and such precision in answering this question (at that time) was not so important. Later, when I was working as a doctor in a forest area, I had to know the implications of a scorpion sting. Scorpions are quite ancient – having been on earth around the time of the dinosaurs. They are also one of the first terrestrial predators adapting mainly to prey on insects and sometimes even small vertebrates like lizards. Of all the 20-odd lethal scorpions, the Indian red scorpion is supposed to be the most lethal. All scorpions have various types of venom which is basically a cocktail of several enzymes that immobilise their prey. The venom is selected to be fast-acting. Of the few species of scorpions that are lethal to human beings, the Buthids are prominent. Buthidae is the largest family of scorpions. The Indian red scorpion is one of the Buthidae. For those who are not so familiar with scorpions, the red scorpion is the smaller one that is more often seen around habitation rather than the larger (greenish-blackish) Heterometrus. Scorpions are quite well distributed across India. However, information at the species level about scorpions seems quite scares on the internet. Perhaps the only good resource on Indian scorpions is this blog maintained by Aamod Zambre. The blog gives several links and resources to scorpion biologists and a key to identification of scorpions in Eaglenest Wildlife Sanctuary in Arunachal Pradesh. Although showing many dangerous-looking scorpions, the ones that often sting humans are perhaps not these; that distinction belonging to the Indian red scorpion. For those interested in the species, its biology and taxonomy, this issue of Euscorpius may be useful. The 1700-odd species are global in distribution are not found only in Antarctica (see this effort at developing an illustrated catalog of scorpions, of which 10 selected pages of part 1 is available for download). Of all the spceis of scorpions, only about 25 species are supposed to be venomous enough to kill human beings. Most of the others, we are told cause pain, irritation, local inflammation and some minor-major cardio-respiratory symptoms. Most scorpions being nocturnal, and preferring crevices and dark corners are likely to go unnoticed. The warm and damp surroundings in houses or the shaded crevice in a dry area are ideal places for the scorpions. Scorpion stings are quite a public health problem. Like many of the other health problems, scorpion sting victims in most rural and tribal areas usually approach the local doctor who is invariably not trained formally in medicine. Herbal and traditional remedies for stings and bites abound. While serving an important role in calming the victim and allaying his fears, a little more than a placebo role may be attributed to these – much like in the case of snakebites. Scorpion stings are very painful causing local inflammation and redness. All scorpion stings are capable of penetrating the skin. The venom spreads very fast and hence the role of scorpion anti venom has been questioned widely in international and Indian literature. The intravenous anti venom may take several hours to reach reasonable concentrations in the tissue where the scorpion sting is already acting. Milder symptoms include vomitting and sweating in addition to local pain. In more severe cases, there may be breathlessness and pink frothy sputum (because of fluid collection in the lungs), variation in blood pressure, shock and even unconsciousness. Most of these symptoms are due to massive release of chemicals called catecholamines (which play a key role as neurotransmitters as well as regulate important autonomic body functions like heart rate, blood pressure etc.) – a phenomenon termed autonomic storm. In spite of all these dangerous sounding words, the stinging is relatively rare. Scorpions are quite shy and even when they sting, the dose of venom injected is often very small, and sometimes even dry. Contrary to the fairly bold advise by the good folks at Auroville to “sweat it out for a few hours”, medical attention to scorpion sting is important. Reducing pain using painkillers and reducing anxiety using anxiolytics is of importance, especially since the victim will be suffering from shock both due to the venom as well as his anxiety. Antivenom is manufactured by Haffkine Institute, named after Waldemar Haffkine, a Russian student of Louis Pastuer who came to India to fight Cholera with a vaccine he developed in Paris. Although the role of the anti venom has been questioned, the importance of keeping the victim under observation cannot be underscored. Monitoring of his blood pressure and watching out for pulmonary edema if any is important. A place with facility to provide intravenous fluids, BP monitoring and if needed positive pressure ventilation may be needed to avert any rare cardio-respiratory colapse or multi-organ failure due to shock. The role of a drug called Prazosin, which reverses several effects of the venom has been widely reported by HS Bawaskar and PH Bawaskar from their decades of experience treating hundreds of scorpion stings in rural Maharashtra. Admirably, they have kept detailed notes and records of these treatments that is periodically analysed and reported in medical literature. In fact, nearly all of what we know about scorpion sting follow-up from India is from this duo. With the availability of medical support and administration of prazosin wherever necessary, a mortality rate of less than 1% has been reported by them. From a case report in Nepal, Bhadani and colleagues report that adequate information about these lethal complications in scorpion stings is not present among health workers – a reason for very late referral or neglect of stings. The Bawaskars report the onset of pulmonary edema anywhere between 5 to 15 hours after the sting and suggest early initiation of treatment with Prazosin – an observation seconded by the Nepal study. In fact, it is now well accepted that the time lapse between sting and prazosin administration determines the outcome of the patient. 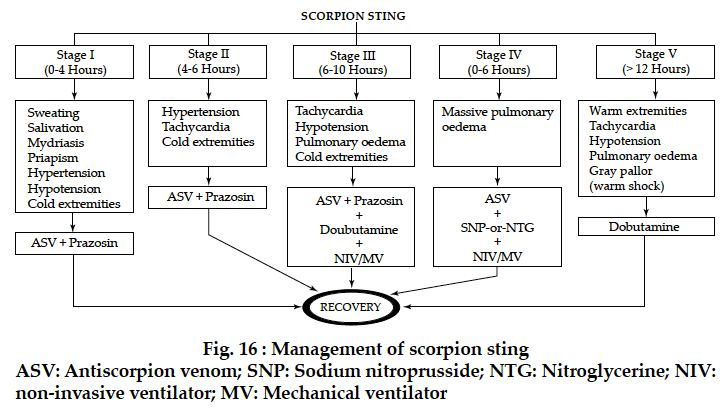 In an article recently in January 2012 in the Journal of the Association of Physicians of India, the Bawaskars present a nice overview of what is known about the epidemiology of scorpion stings, pharmacology of its venom, local and clinical manifestations of stings, clinical findings and notes on management with details on when to administer prazosin. In addition, a brief note on prevention of scorpion stings is given. From my experience, I find that scorpion stings are very rarely the problem of people walking or working in forest areas. It is often reported from homes where people “ambush” the scorpion in its hideout rather than in an open jungle where people walking even carelessly, give enough time for the scorpion to move away. However, awareness on the potential lethality of scorpion sting and ensuring transport to a place with the basic facilities to deal with the complications (if any) is important among people living in rural/tribal areas as well as people working there. This entry was posted in Notes, Public Health, Reviews and tagged Buthidae, clinical management, scorpion sting, scorpions. Bookmark the permalink. Hi Daaktre, this is really useful. But this treats all scorpions together, do you have any specific treatment advice for cases where at least the genus has been identified? From what I know (and read), the most stings are recorded by the Indian red scorpion; perhaps because of its shared habitat with humans. Most of the others, although dangerous looking are much less lethal (although all are venomous to varying extent). That said, scorpion antisera are supposedly species-specific. Hardly anything is documented about the symptoms after particular species of scorpion stings. Most (?all) Indian scorpion sting literature is on Mesobuthus tamulus. The antivenom available is also for this species. “AScVS is lyophilized monovalent enzyme refined immunoglobulins specific for the scorpion Mesobuthus tamulus concanesis Pocock. 1 ml. of AScVS neutralizes 1 mg. of dried scorpion venom. Usual mode of AScVS administration is either by i.v. or i.m route.” (In quotes is from JAPI article – http://www.japi.org/april2006/O-283.pdf). In any case, what we do know is that although in vitro, the antivenom neutralises the venom (done in frogs and rats), in reality, considering the time taken for transport and shock etc, there is no evidence that it works – see this review of 69 studies which shows no benefit. (BMJ – http://emj.bmj.com/content/22/3/195.1.full). On the other hand, the drug Prazosin (as explained above) has clear benefit. I feel this may be the case for all scorpion stings, given present evidence. Thanks for the very informative piece.What would be the dose of Prazosin in this case? Can I use prazosin even if the patient is hypotensive? Ok I got the information in the link provided above.Thanks once again. Very relevant. Thanks Ajay – glad that you found it useful. I have linked most of the statements to some useful articles. With every movement that the scorpion made his poison moved in Mother’s blood, they said. I watched the holy man perform his rites to tame the poison with an incantation.